Etna is a special place. Visiting Etna helps to understand how small mankind is. 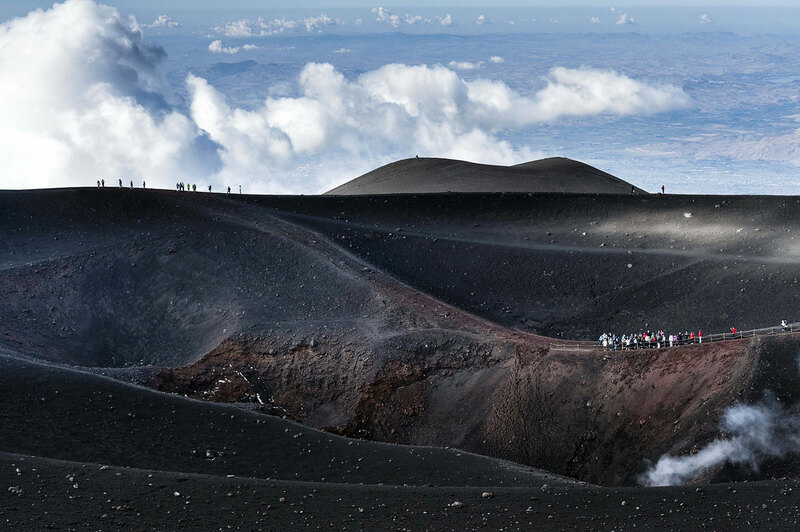 Etna leads us back to our real dimension. A mountain that changes every day, just like us. Every day a bit of ash, a bit of dust, some snort smoke comes out of it. And the landscape changes noticeably. This smoke brings new land to the mountain, which grows and regenerates. A process which is very similar to what we all go through every day. Many things climb to the sky in this small green navel coming down from above. The most striking one is that plume of smoke that you see when you look up, which comes up from the gnomes’ hat on top of the mountain. For over five hundred thousand years It never ceases to snort, and pours ash and stones that settle throughout the flow of the seasons, and are sometimes accumulated, sometimes swept away by water. Sometimes remixed and covered by lava flowing, hidden in the green and rural cultivation for hundreds of years, until, patiently, nature begins its work to conquest the rock and gives us irregular hollows, small vessels of land which gives wonderful fruits. The vineyards of Fessina are one of these earthen vessels particularly rich in its poverty. Between Linguaglossa and Randazzo you can meet many of these forms that caress the vineyards as generous nurses. These vineyards give very different wines, generated by soils and microenvironments that are so specific that they become unique. Today in Sicily we witness the rebirth of poetic and lyrical wines, which perfectly describe the profound identity of this land, its sun and its heat, the colors of the land, of the sunrises and sunsets, places known and those still not found, with elegance as decisive goal. The verticality, the rigor which is behind the new Sicilian style that is emerging worldwide.